U.K. Police Investigating 2 New Cases Of Deadly Nerve Agent Poisoning Police in Britain say two people have been exposed to Novichok, the same nerve agent that poisoned former Russian spy Sergei Skripal and his daughter, Yulia, in March. 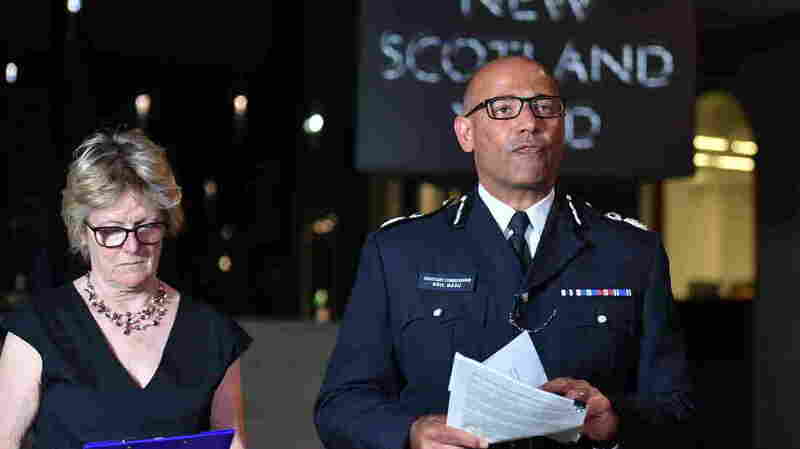 The U.K.'s head of Counter Terrorism Policing Neil Basu (right) and the chief medical officer for England Dame Sally Davies, speak at a news conference at New Scotland Yard in London on Wednesday. British police say a couple who are critically ill were exposed to the Russian nerve agent Novichok. "We can confirm that the man and woman have been exposed to the nerve agent Novichok, which has been identified as the same nerve agent that contaminated both Yulia and Sergei Skripal," a statement by Neil Basu, the head of U.K. Counter Terrorism Policing, said Wednesday night. The Skripals' case sparked international outcry and set off a diplomatic row resulting in the expulsion of dozens of Russian diplomats from the U.S. and NATO member countries, and a reciprocal response from Moscow. U.K. Home Secretary Sajid Javid spoke to Parliament on Thursday and called on Moscow to explain "exactly what has gone on." NPR's Alice Fordham reported on All Things Considered that police initially thought the couple in Amesbury had taken contaminated illegal recreational drugs, and warned people who had taken crack cocaine or heroin to be extra careful. But they continued investigating and now believe the couple has been exposed to the military-grade chemical weapon known as Novichok. Amesbury is just a few miles from Salisbury, where Sergei Skripal — a former Russian spy and British double agent — and his daughter were poisoned with Novichok in March. The two eventually recovered. Authorities say they do not know how this new couple came into contact with the poison. Police officers on the scene outside Harcourt Medical Centre in Salisbury, thought to be connected to a man and woman in Amesbury who are in the hospital after being exposed to what police confirmed was Novichok. "There is no evidence that either the man or woman recently visited any of the sites that were decontaminated following the attempted murders of Sergei and Yulia Skripal," Basu said in the statement. "We are not in a position to say whether the nerve agent was from the same batch that the Skripals were exposed to. The possibility that these two investigations might be linked is clearly a line of enquiry for us." Javid said the two people being treated for the most recent Novichok exposure, appear to have come in contact with it somewhere different than the Skripals did. "Our strong working assumption is that they came into contact with the nerve agent in a different location to the sites that were part of the initial clean-up operation," he said. Areas in Salisbury and Amesbury have been cordoned off to the public, and Fordham reports this new poisoning has caused fears in the local community. Sergei Skripal came to Britain as part of a prisoner swap in 2010. He was found slumped over on a bench on March 4, along with Yulia. 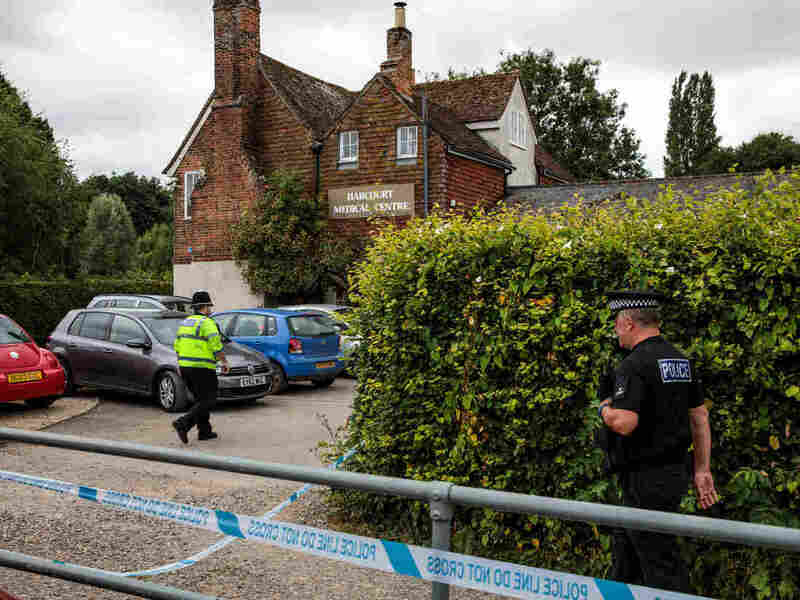 Police say the two had been poisoned at their home and that their front door proved to have a high concentration of Novichok, which was first developed in the Soviet Union in the 1970s. Yulia was discharged from the hospital in early April, and Sergei in May. "The Russian state could put this 'wrong' right, they could tell us what happened, what they did and fill in some of the significant gaps that we are trying to pursue," Security Minister Ben Wallace told BBC radio on Thursday. A Kremlin spokesman was quoted by Reuters as saying that Russia regrets that the two Britons who fell ill are in critical condition and hopes they recover quickly.